Beer Week is over. Nice as it was, now’s a good time to pump the brakes on suds and sausage and reclaim a seat at the big boy table. 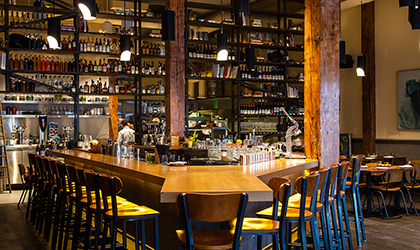 Our pick, Mid-Market newcomer Alta CA: guaranteed to confuse your phone’s map program with its deceptively geographical name, and guaranteed to impress your date with its sophisticated and playful offerings in both the food and cocktail categories. 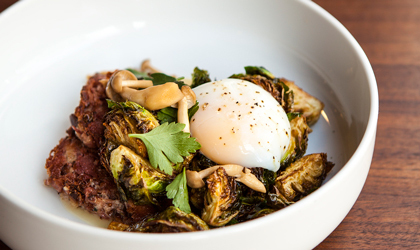 The newest feather in the Daniel Patterson Group’s cap (Coi, Plum and Haven Oakland), Alta’s menu is an upscale take on bucolic California chow with a bounty of seafood and meat and a bare minimum of kale. Standouts include the smoked trotter and the slow-cooked pork shoulder (rookie chef Yoni Levy knows his way around some swine), along with the savory hen-of-the-woods mushroom porridge and smoked trout. Order a few plates. Share. It makes for nice table talk. In the cocktail department, the Ferryman is king. Tequila, pomegranate and fiery bitters with a little seasoned salt to cut through the minimal sweetness. The bar is big enough to handle drop-ins, but if you mean to take a seat, we recommend a reservation. And yes, they do have beer.